When it comes to horseback riding, your comfort and safety are everything. Think about the last time you rode a horse, even if it was a pony at the state fair when you were just 8 years old. If you were older, you likely hopped on the back of the horse yourself, and if you were just a kid, you probably had your mom or dad hoist you into the saddle. 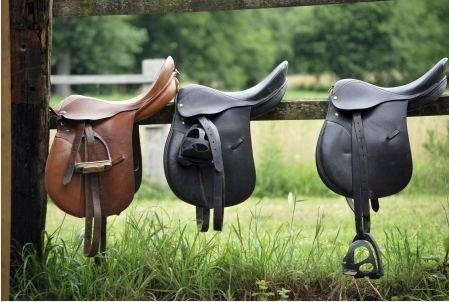 Did you know, though, that a saddle is just part of the overall horse tack? There are many different components that make up tack, so let’s go through what they are, what they do and how these tack items help the horse. Tack can be fairly heavy in weight, as there are many different parts and materials. Tacking is designed to ensure your horseback riding adventure is enjoyable, comfortable and safe. So what makes up tack exactly? We’ll tell you! Tack includes many other components, including a breastplate, martingale, crupper, bit guards and fly fringes that are used in conjunction with a saddle, bridle or both. There are also horse rugs that come in all different patterns and colors. There are certain kinds specifically designed for different uses or activities like exercise, sweat, fleece, foal and more. There are also many different types of bridles available, such as endurance, double, bosal, hackamore, and many others. To learn even more about tack and the different parts of putting together a full tack kit, visit Equestrian and Horse. Tack is essential to horseback riding. Having all of this equipment allows you to drive the horse to where you want him or her to go. With the saddle you sit on; the girth to support the saddle; the birch to help you direct the horse in the way you want him or her to go; and the stirrups to help improve your position and keep your feet from dangling on the sides, tack is a pretty complex and integral element to horseback riding. To ensure your tack remains in good condition, it’s important to hang it up in a safe area. Tacks are most often posted up in barns, like those from Deer Creek Structures. If you need a place to store all your horseback riding equipment and horses, call Deer Creek Structures today at 254-546-2276 to learn more about our different barn configurations that would be perfect for you!